Congratulations to this month’s teacher of the month, Donna Cabrera, a Family & Consumer Sciences Middle School teacher from Pennsylvania. While this is her first year teaching FACS, she is no stranger to the classroom, having taught Special Education for 10 years. With a limited budget for 750+ students, I wanted to show them how they could stretch a dollar and still eat well. I purchased 5 pasta machines (the old fashioned crank kind), and students made their own dough, kneaded it, and put it through the machine to make homemade pasta! They worked collaboratively and helped each other so nicely! It brought them together as a group and the students were excited to share the experience with their family. 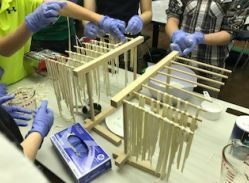 I showed them how inexpensive it is to put the effort into making their own pasta for their families. Many students purchased their own machines ($20). They still talk about the pasta lesson! I research constantly on this website, as well as others. I try to keep my lessons as “hands on” as possible, to accommodate all of my students. Working as a “Kitchen team”, helps everyone be involved. I am also involved with a local college, inviting a guest speaker in to speak about nutrition and culinary methods. I love to cook and know a lot about nutrition, so I feel that I can make a difference in my student’s lives. 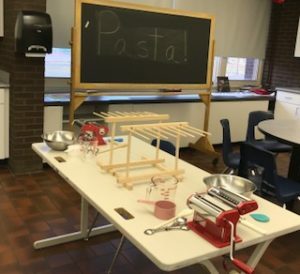 I want my students to be self-sufficient in the kitchen. I teach them how to budget their money when making a dish and how to repurpose food from the night before. I know this will have an impact on their families as they shop and cook with them. I showed them how to get the best deal (unit rates) at the store and challenge them to shop with their family.